Fluffy and extra syrupy! A mouthwatering Greek walnut cake recipe, scented with the aromas and blends of cinnamon and grounded clove. 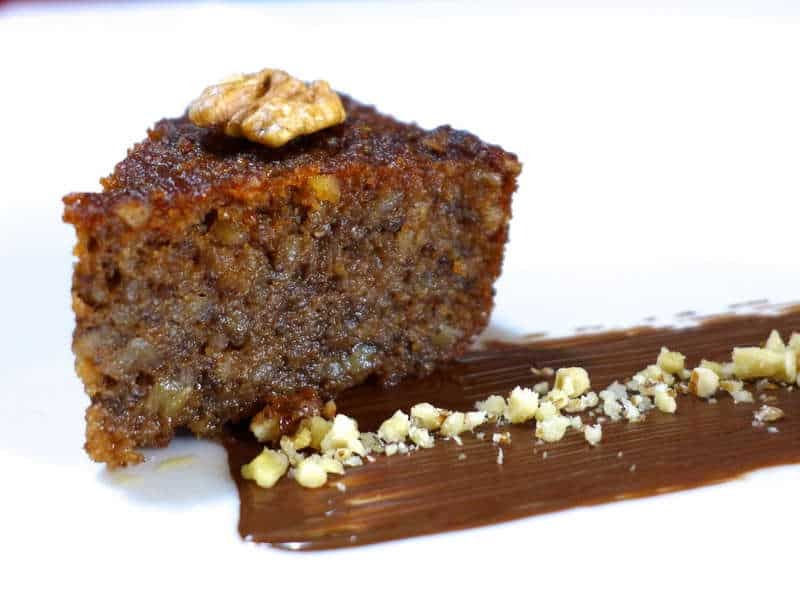 This is the traditional Greek walnut cake recipe which calls for galeta (powdered breadcrumbs) instead of flour and is infused with a cinnamon flavoured syrup. Oh and you can always read this delicious recipe in Greek here Παραδοσιακή Καρυδόπιτα σιροπιαστή Συνταγή. Use an electric mixer to mix the sugar and butter; mix at medium-high speed for at least 5 minutes, until smooth and creamy. Add the egg yolks, one at a time, whilst continue mixing; wait each time for each egg to be absorbed, before adding the next. Pour in the cognac and the orange zest and mix for 10 more seconds. Set aside. Combine the two mixtures and blend, until smooth. Place the egg whites into the bowl of the electric mixer, along with a pinch of salt. Make sure your egg whites, bowl and whisk attachments are clean and free of any water. Whisk the egg whites until the mixture is very thick and glossy and a long trailing peak forms when the whisk is lifted (meringues). With a spatula add gradually the meringues into the mixture and blend with light circular movements from the bottom up. Butter the bottom and the sides of a round baking tray, approx 30cm diameter and bake in a preheated oven at 170C, for about 35 minutes, until nicely colored on the outside and baked through. Let the karidopita (greek walnut cake) to cool and then prepare the syrup. Add all the ingredients for the syrup into a pot, and boil, until the sugar has dissolved. Scar the cake into pieces, and slowly ladle the hot syrup over the cold cake, allowing time for each ladle of syrup to be absorbed. Let it cool down for a while, before serving. This greek walnut cake is ideally served cold with some vanilla ice-cream aside. Enjoy!! This cake is sublime! It seemed complicated at first with the preparation of walnuts and breadcrumbs, but it certainly was worth the effort. I usually use a recipe from Anne Theoharous which has always been very successful and popular with family and friends.I tried this recipe as it is a flourless cake and it was the lightest, most delicious cake I have ever made. I didn’t put Cognac in the syrup, but I added the peel and juice of a tangerine 4 cloves and a stick of cinnamon. Thank you for another wonderful recipe. Is it possible to substitute the breadcrumbs with powdered walnuts at all? The cake turned out terrific. I was wondering if it can be frozen? Hello where is the honey in the ingredients list for this “honey infused treat”?